I think of blogging as a form of drawing attention to oneself. But who exactly is paying attention to the blogger? Is the attention that we get the right kind of attention, or is all attention good? I checked last month's stats on my own site and fully a third of the hits were on my post on the frilled lizard boat. 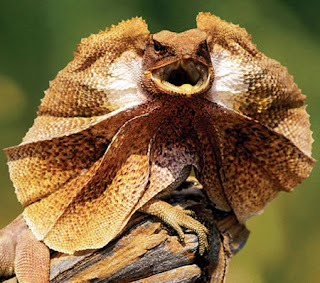 Now I don't know where these hits come from, but I suspect that somewhere out there are school children who are doing a report on frilled lizards and stumbling onto my blog pages. They are most likely disappointed by the results, but they will at least walk away with a nice photo of a frilled lizard. But they won't really care about what I have to say about kayaks and kayak paddles and water. So then, my real audience, the people I am addressing in my imagination is really much smaller than I imagine. But still, large numbers are good for the ego and I can pretend that the people who search for frilled lizards really do care about what I have to say.